LEGAL ASSISTANCE ATLETE / ALL. 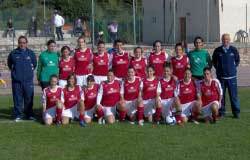 Suffered, but deserved promotion in series "A2" for the girls of Castelvecchio Women's Football which is a warm applause after the victory of 8 May in Vignola against Olimpia-Vignola (1 - 4). This is the victorious formation: Pacini, Baiocchi, Gnoli, Balacchi (57 'Cignali), Paganelli, Canini, Benini, Teodorani, Farnedi (66' Fusconi), Lisi (80 'Amaduzzi M.), Guidi. Available at Bizzochi, Amaduzzi A., Fusconi, Cignali, Amaduzzi M., Fiorenza, Tani. Hispellum Calciofemminile after a first half closed and the advantage well played, at the beginning of the recovery pays a very expensive price 10 minutes of sheer madness. 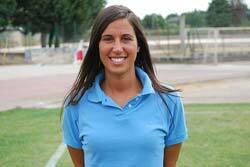 In fact in these minutes takes four goals and compromises the qualification in A2. It is not that the situation is irremediable for what has been seen in the field, but surely it will not be easy to overturn the result in Sardinia, even if the Hispellum is not yet declared beaten. Under an authentic storm the game began with the Umbrian girls forward in search of the advantage, on the contrary the Sardes well prepared in the field defended themselves not disdaining to appear in the half field of Spellane every time the opportunity presented itself. A beautiful and hard-fought match with the Gordige who, between the friendly walls and in front of a beautiful public dressed in the blue-white stadium of the via Split, wants to make a good impression and win the entire prize. The Salento Women wins the salvation in the Serie B championship of women's football at the end of a season that has definitely started uphill for the Giallorossi. Just say that on the eve of the last day of the first round, the Giallorossi were relegated to the last place in the standings with 1 only point and behind the Castellana with 7. The comeback of Salento Donne brings the signing of a group intended as a company, technical staff, team and fans; no one has spared any effort to cut the coveted goal of salvation. "A salvation at no cost - underlines the president Lino De Lorenzis - considering that the only expenses incurred are related to the transfers, the registration to the championship and the rent of training camps and official competitions. Last stop series "A2" for the Castelvecchio of Savignano sul Rubicone that shows up on the Comunale di Vignola against Olimpia in full force, followed by an array of 150 fans with flags, banners, trumpets and balloons and with a mad desire to redeem the hoax of Godige (Venice) three years ago where they lost the promotion to the last day. 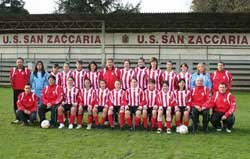 A historic day for the women's san zaccaria football, which for the first time ever won the promotion in a2 and the title of the b series champion, an excellent job of balacih and of its staff and of all the girls who achieved this result. Real Meda wins the 3 place! It ends with the result of 3 to 0 for Real Meda the Serie B Championship and with the conquest of the 3 ° place in the standings after the conquest of 21 points on 24 available in the last 8 league games. 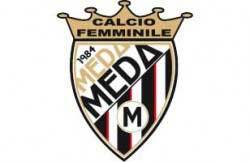 Great satisfaction and deserved result for the girls of Real Meda. Read more: Real Meda conquers the 3 place! On a beautiful sunny day, in front of an important public setting in Savignano sul Rubicone you play the penultimate game between Castelvecchio and Anspi Marciano. Right from the start the last guest team in the standings shows they can not counteract the tactical technical superpower of the team of Mr. Leandri. Castelvecchio strong and at the first attempt goes in the net, minute 2 ° Teodorani from midfield launches on the left wing Amaduzzi M. with millimeter precision calibrates a ball for Guidi that bypasses the goalkeeper and deposits on the net. Promoted with full marks both teams in the beautiful game a2 and correct score will play the title of champion on the last day. The scream of joy reaches the 89 °! The scream of joy arrives in the queue for the girls of Salento Women who one minute from the ninetieth score with captain Serena D'Amico the goal that can be worth salvation. For the Giallorossi three heavy points in view of the decisive clash next Sunday on the Castellana field. At 90 'from the end of the season in fact Salento Donne occupies the third position in the standings with 15 points in front of Real Marsico with 14 and Castellana with 12. The Lucas have a turn on the affordable card against a Cosenza already safe for which the team that relegated to Serie C could come out of the Puglia derby between Salento Donne and Castellana. In case of an equal number of points, the playoff will proceed. Read more: The scream of joy reaches the 89 °!